The washing machine finally passed away. It died a slow, agonizing death, grinding obstreperously to a permanent halt, it’s last load on Earth washed (but sadly not quite finished), just a few weeks ago. After 2 weeks of not-so-pleasant “discussions” about replacing the ol’ girl, the man broke down and bought us a new washer/dryer, on sale of course. 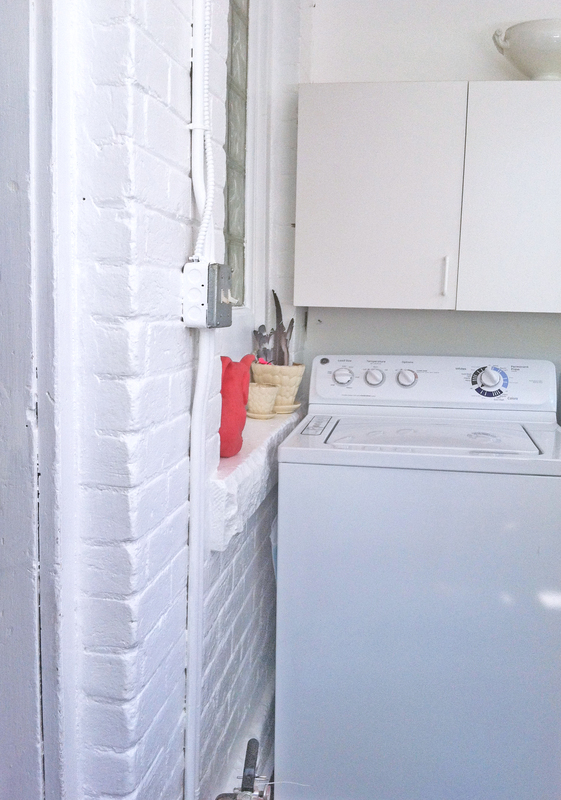 (The old dryer was “vintage”, from the early 80’s. I kid you not. The new pair was $798 from Home Depot, thank you Honey!) The laundry room was, to put it mildly, a Screaming Disaster (exposed stained and warped wood sub-floor, really bad paint job with 3 different shades of “white”, and dirty as Hell) It’s been a constant embarrassment for years, so I took this as my chance to make-over the laundry room, on an extreme budget as usual. 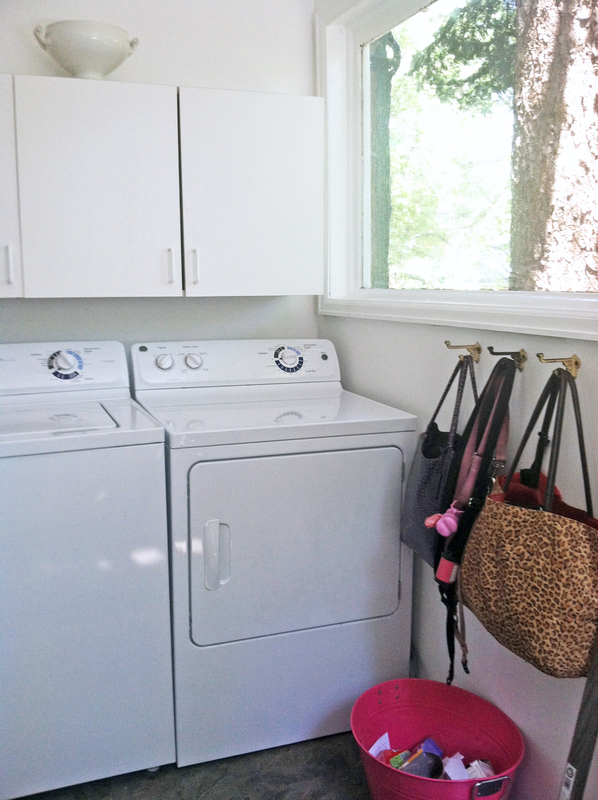 The laundry room is also the back porch, and the only pass-through to the backyard and garage, so I want to make it pretty as well as efficient. Part One here details the first steps, the floor and walls. Yikes. Just seeing the pictures again makes me cringe. Note the cheap zebra rug attempting to hide the ugly wood floor. This decorating idea NOT recommended. It took 3 coats of Ultra White paint-n-primer on the walls and ceiling and 3 coats Ultra White Gloss on the brick and trim to erase all the badness. 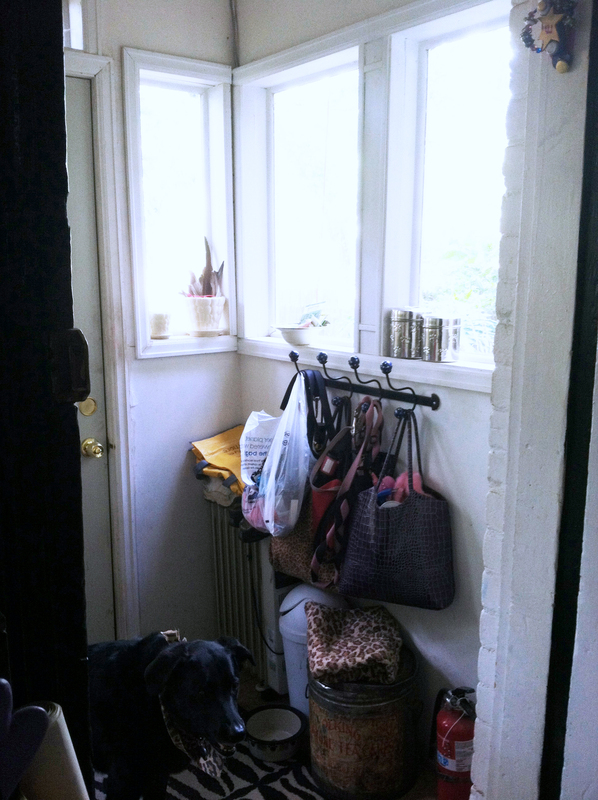 In Progress…just look at the filthy door! Yuck. Next came the floor. 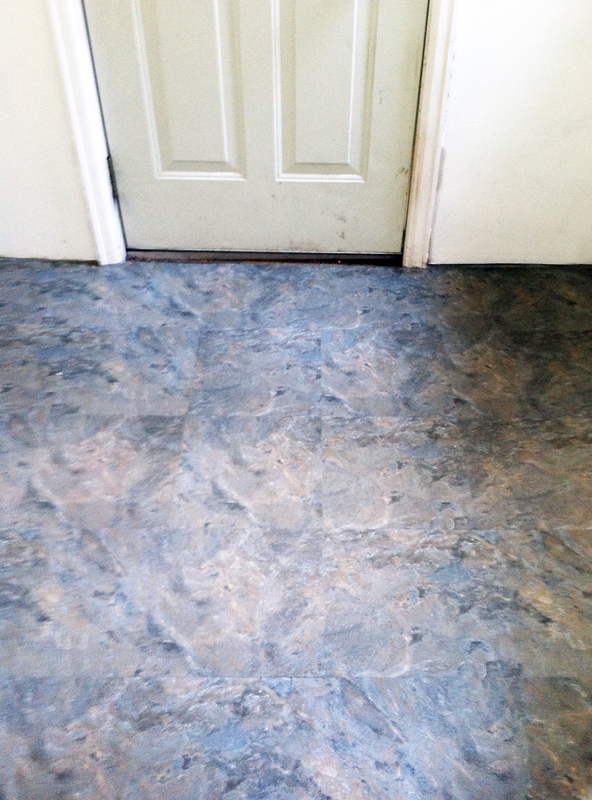 We went with good ol’ peel and stick vinyl flooring because it is cheap and easy, but there’s a trick to getting it to look good. More on that later… First we nailed down the loose and popping-up edges of the wood, and prepped it with Levelpro, which helps the peel-n-stick tiles adhere. 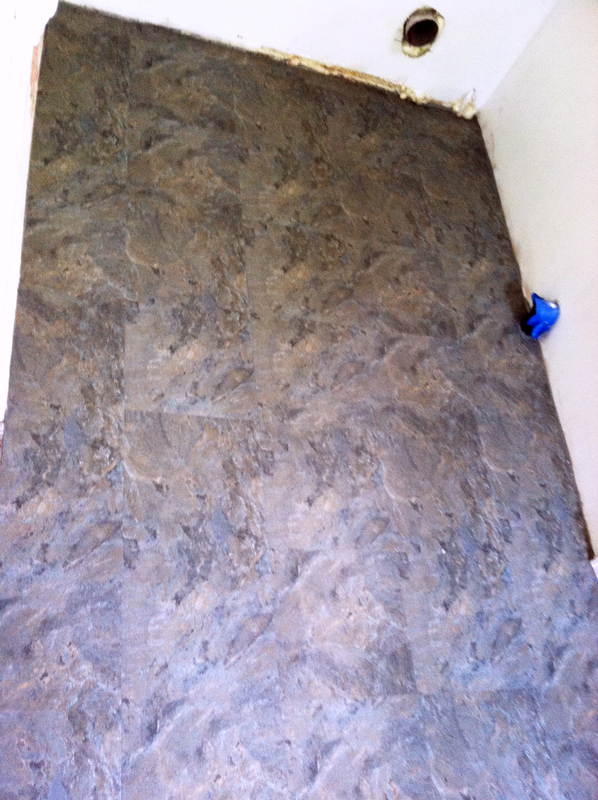 After this cured overnight, the tiling began. I measured to find center, which was not an easy task as the room is more akin to to a trapezoid than a rectangle (oh the joys of 100+ year-old houses), then started sticking down the tiles. The edges of the room were a real challenge (again because there are no straight lines in that room) but careful measuring got the job done. Then I got on my hands and knees with my marble rolling pin to help the tiles adhere (I’m sure that was quite a site, we really should have taken pictures of that part). There is one more very important last step. “Grouting” the tiles. Bet you didn’t know you could grout these things, but not only does it look great and cover a world of tile-laying sins, but creates a water-tight seal. 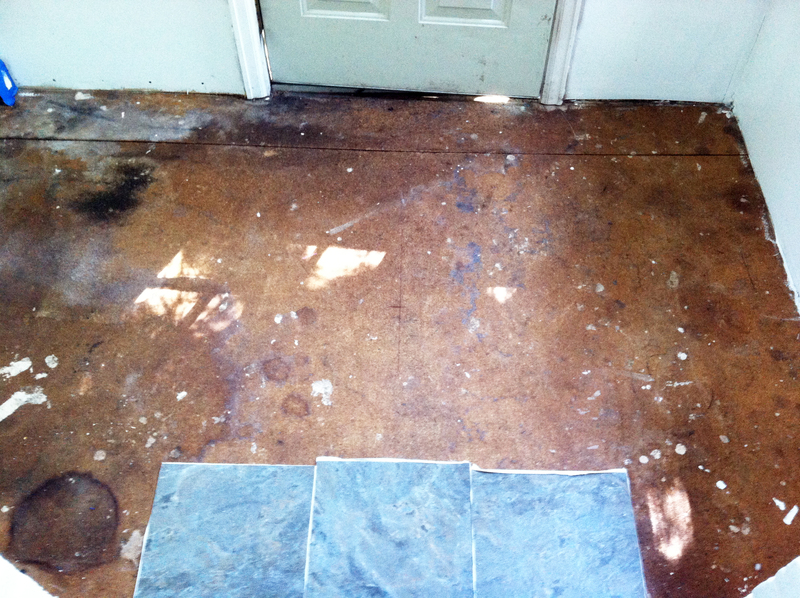 (no more damage to the wood sub-floor!) The answer is caulk. 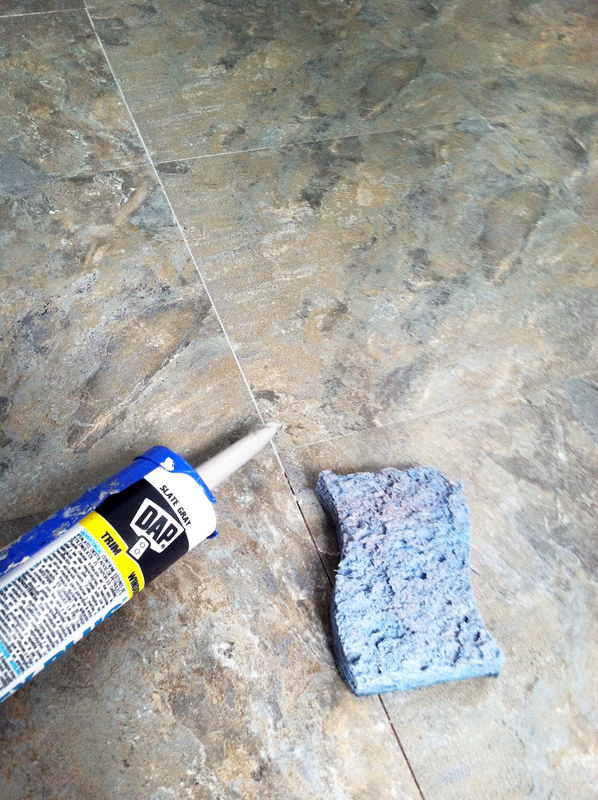 Simple latex caulk in a color that goes with your tiles. (in my case, a medium gray) You just run a thin bead of the caulk along the edge and literally smush it into the crack with your fingers, then wipe off the excess with a damp sponge (keep a bucket of warm water next to you for rinsing out the sponge). 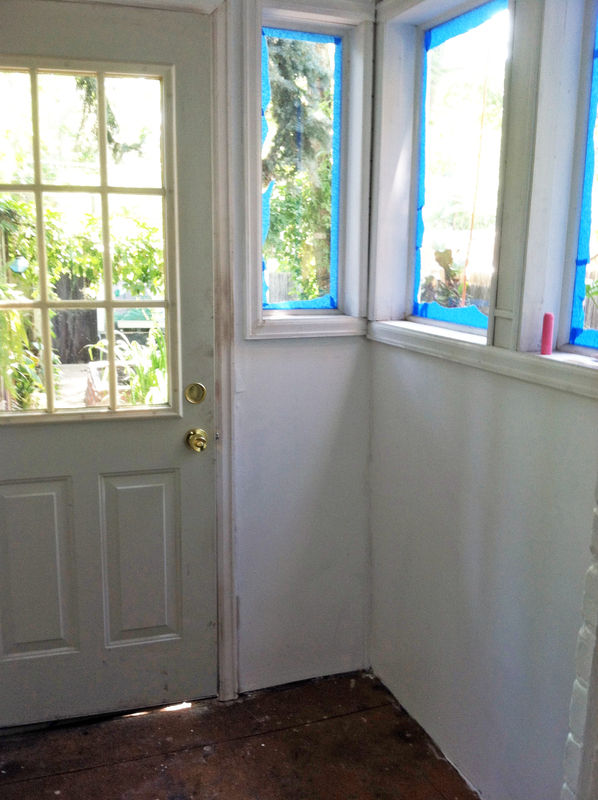 Then I went around the entire outside edge of the tiles with the caulk. 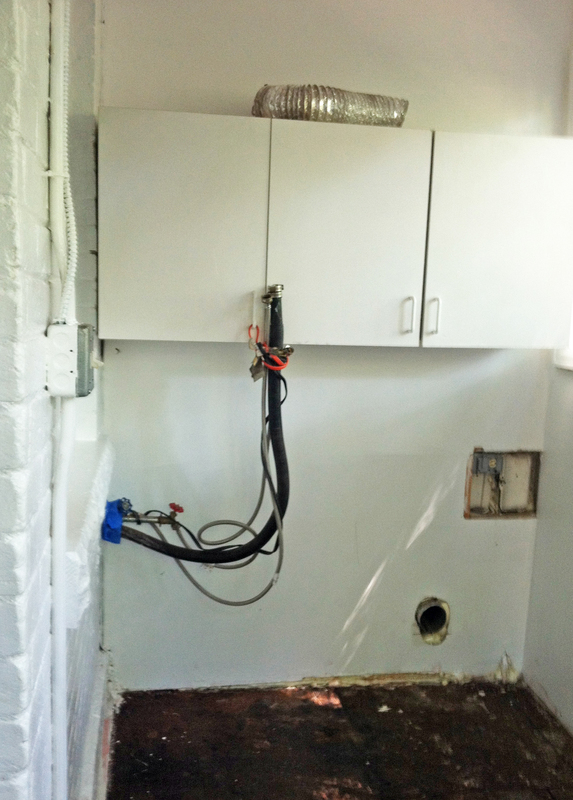 No more worrying about damage from leaking pipes or snow dragged in on the boots. And, it looks great! A hearty thanks to my favorite handy man, Bob Bigum, for teaching me this trick. (Thanks Bob!) FYI, the whole floor took about 5 hours. 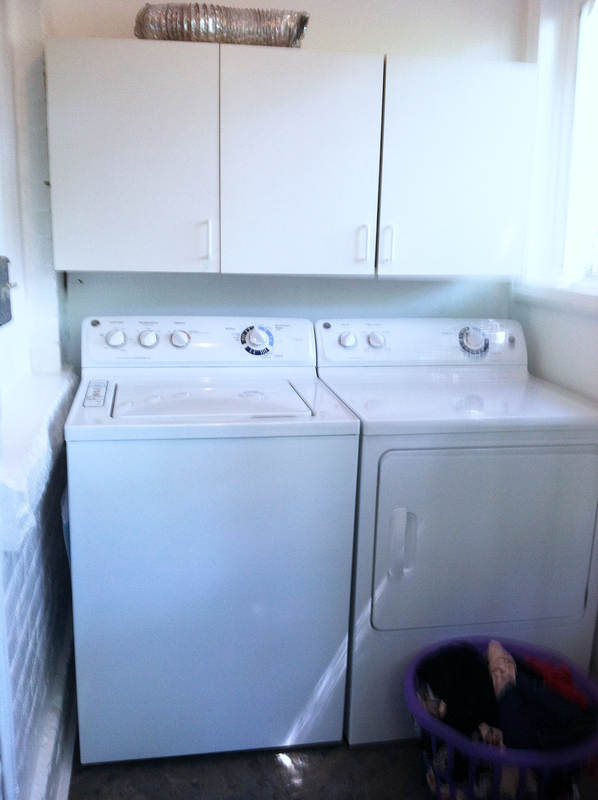 Then the new washer/dryer arrived, hooray! There’s nothing more exciting than clean clothes when you’ve gone without for 2 weeks. 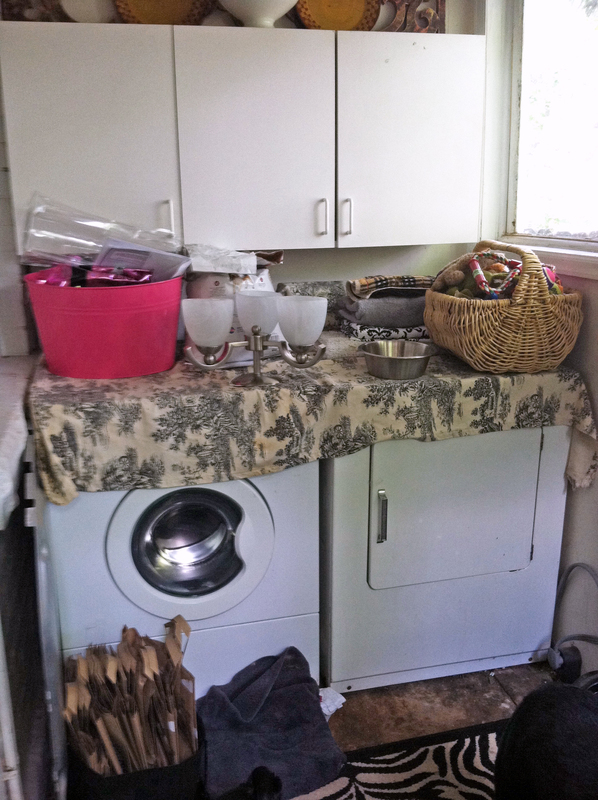 As you can see, I’ve started in a little bit on the decorating, but there is a ton more to come, including a funky ceiling design, a fabric cover-up for the washer/dyer, and a weird and wild sort-of faux taxidermy thing for over the washer/dryer. I’m just getting started! Subscribe to the blog so you won’t miss a thing. Notes: As you can probably guess by now, I’m going with a black-n-white theme in here. 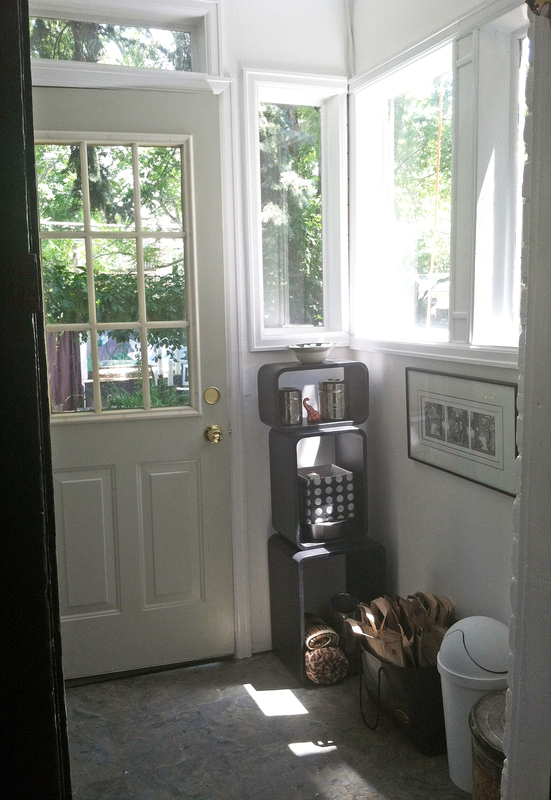 You may recognize the black stacking shelves from this post: My new FREE Nightstand!, which I have since replaced and re-purposed the shelves here in the laundry room. The signed limited edition black and white Edward Gorey print on the wall came from another room, and originally came from Goodwill for $5.99. Those neat old hooks holding up the bags of dog supplies were in the house when it was purchased, I just moved them here. What projects are you working on this weekend? I’d love to hear about them in the Leave a Reply section. Hope you’re having a fun DIY weekend! This entry was posted in decorating, DIY, home, lifestyle, Uncategorized and tagged bargain hunting, best for less, black and white, budget, decor, decorating, DIY, Goodwill, Home Depot, laundry decor, laundry room, laundry room decorating, laundry room make-over, laundry room redo, peel and stick flooring, peel and stick tiles, redecorating, redo, restyle, saving, seal vinyl tiles, style, thrift store, thrift store shopping, thrifting, vinyl flooring, vinyl tiles, washer dryer, zebra rug. Bookmark the permalink.